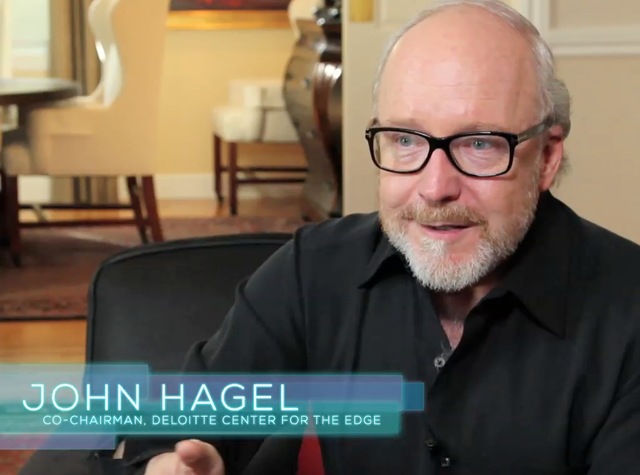 John Hagel III is an author and management consultant who specializes in the intersection of business, strategy and technology. He currently serves as co-chairman of the Silicon Valley-based Deloitte Center for the Edge, which conducts original research and develops substantive points of view for corporate growth. Prior to Deloitte, John’s impressive resume included time as the principal of John Hagel and Associates, Chief Strategy Officer at 12 Entrepreneuring, Principal at McKinsey & Company, Founder and CEO at Sequoia Group, consultant at the Boston Consulting Group and Senior Vice President of Strategic Planning at Atari, Inc.
and his BA at Wesleyan University in 1972. John has been honoured as Accenture’s (2003) Top 100 Business Gurus, Network World’s (2002) 50 Most Powerful People in Networking and the World Economic Forum’s (2000) Forum Fellow. In 1999 Business Week Magazine named John Hagel one of the 25 ‘Most Influential People in Electronic Business’. Upside designated him as one of the ‘Elite 100 Most Influential People in the Digital World’ and in 1999 and 2001 Hagel received the McKinsey Award for two articles: “Unbundling the Corporation” and “Your Next IT Strategy” published in the Harvard Business Review. John wrote Out of the Box: Strategies for Achieving Profits Today and Growth Tomorrow through Web Services and is the co-author of two bestsellers, Net Worth: Shaping Markets When Customers Make the Rules and Net Gain: Expanding Markets Through Virtual Communities. John’s ideas have been featured in a diverse range of business publications, including the Harvard Business Review, The Wall Street Journal, Financial Times, McKinsey Quarterly and CIO Magazine. jhagel thank you! Always grateful for your generosity of spirit, time & wisdom!